Economic security—having a stable, sufficient income to meet your basic needs—is critical to the health and well-being of people and neighborhoods and to the growth of local and national economies. Yet, for tens of millions of Americans a basic, adequate standard of living is out of reach, while millions more balance precariously on the edge where even a short-term illness, loss of income, or emergency expense can be insurmountable. Today, roughly 106 million people in the United States—one in every three—are economically insecure, defined as living in households with incomes at or below 200 percent of the federal poverty level. A new report by PolicyLink and the Program for Environmental and Regional Equity at the University of Southern California, “100 Million and Counting: A Portrait of Economic Insecurity in the United States,” shows that despite low unemployment, economic insecurity is rapidly growing. Since 2000, more than 25 million people have become economically insecure, a rate that is twice the nation’s population growth. Produced with the support of the Mastercard Center for Inclusive Growth, the report represents a critical step toward addressing barriers to economic progress and bringing millions of people solidly into the middle class. Regionally, the South, the Mexican border regions, and American Indian reservations, has long endured persistent poverty. It is not surprising, then, that economic insecurity more broadly is also concentrated in those regions. But, economic insecurity (which includes those not officially in poverty but still unable to consistently make ends meet) is also concentrated among whites and people of color in the Northwest, Appalachia and the Mid-South as well. Nationally, people of color are 38 percent of the total population, but 52 percent of the economically insecure population. In some cities, the disparities between people of color and Caucasians are even more stark. 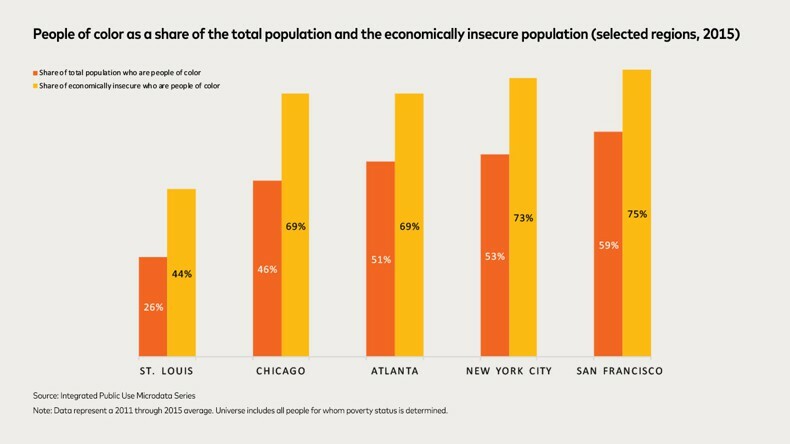 In San Francisco, for example, people of color represent 59 percent of the total population; however, they are 75 percent of the economically insecure—a 16 percentage point difference. In Chicago, the gap is even wider, at 23 percentage points. The report reveals that the vast majority of economically insecure adults who can work are working, but at pay scales that do not support a decent standard of living. For the rest, persistent unemployment, underemployment and barriers to entering the workforce are a major challenge. Others have given up looking for work. Among those who were at least marginally attached to the labor force, 38 percent have become discouraged about finding a job and stopped looking. Many are unable to enter the workforce because they lack access to transportation to jobs, struggle with illness or disability or are unpaid caregivers for loved ones at home. The economically insecure are also much more likely to be self-employed, with women of color representing the fastest growing group of entrepreneurs in the U.S. However, a lack of access to capital often stifles the growth of their businesses. Assets and support systems make life more secure. But for those on the margins, assets and supports are a luxury. One in five economically insecure households, for example, lacks access to a car and is more likely to drop out of the workforce because of transportation issues. Many are burdened by housing costs, particularly in urban centers. And, of the 13 million economically insecure who are older than 65, many have little or no retirement savings and struggle to manage growing health-care costs. A mounting body of research suggests that such inequality and exclusion lead to declining economic growth. The inverse is also true: by developing high-impact, targeted solutions that dismantle barriers and connect economically insecure people and households to resources and opportunities, we can lay the foundation for an economy that works for everyone. The report highlights proven and promising new policy innovations that can be leveraged at the local, state and national levels to close racial gaps in employment, income and wealth, and to create robust systems for inclusive growth to build economic security for all. Innovation to help struggling workers build assets and wealth. New products, services and partnerships can help the rapidly growing segment of economically insecure workers manage volatile incomes, access portable benefits and save for retirement. Preparing the workforce of the future. Ensuring equitable growth will require reducing inequities in education and better alignment between educators, policymakers and employers to create a workforce pipeline that can adapt to rapid technological change. It will also require new infrastructure to support lifelong learning. Targeted efforts to support entrepreneurs of color. Increasing business owners’ access to financial services, credit, mentors and other tailored services can unleash their growth potential and address disparities. Private companies can partner with non-profit groups to explore, test and advance new ideas by leveraging their scale. Connecting underserved communities to jobs and resources. Public-private partnerships can help improve the breadth and reliability of transit to ensure job opportunities are accessible to lower-income neighborhoods. Companies can also partner with local and regional officials and community groups to develop data insights that inform equitable development. Building a pathway toward economic security for the 100 million is both an imperative and an opportunity—if we can tear down the structural barriers that hinder participation and unlock the untapped potential of our growing and diverse population, everyone stands to reap the benefits of a stronger and more inclusive economy.